Well, my co-contributor Chef Edwin is going to smack his forehead when he sees this post, but I can’t let that stand in my way, right? I’m still stuck on Christmas, and I have the leftover Christmas cookies and constantly expanding waistline to prove it! It seemed to me like more people than ever were baking for Christmas this year, and I had no qualms about sampling everything that came my way. From leftover Bake-A-Thon 2008 treats, to sweet, melt-in-your-mouth Baklava from a friend at my mom’s office, to moist spice cake from a new significant other on my husband’s side of the family… my Christmas holiday consisted of enjoying delectable new desserts. Thank you, everyone! I’d like to share with you a recipe that I brought to Bake-A-Thon 2008 this year, but I also made it again on Christmas Eve with my mom. It has been a favorite of mine for years. My mom originally found it in a Better Homes cookbook; I have adapted it to include more pumpkin and more chocolate chips which I think makes them even more moist. 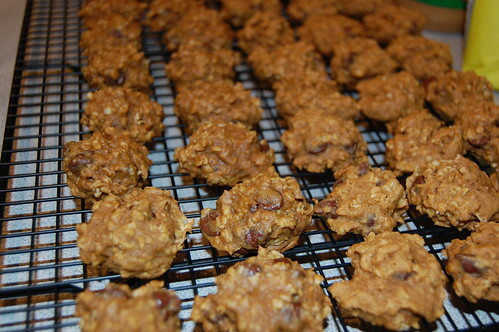 1)You only need two bowls to make these cookies. 2) You do not need any fancy tools, appliances or decorating devices. 3) They’re not overly sweet. 4) Because of the pumpkin, they stay incredibly moist after several days. They’re also great for mailing (which I tested this year). 5) If you use high quality chocolate chips (I like Ghirardelli), the chocolate adds a perfect amount of sweetness. 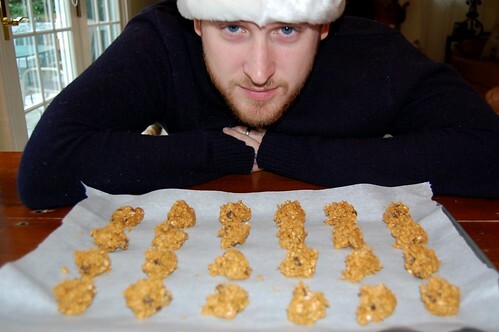 6) It makes 120 cookies. 120! Let’s face it, when you’re baking Christmas cookies you’re probably looking to make more than one dozen. 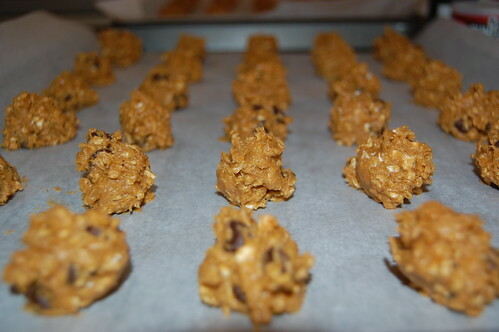 7) They contain 3 cups of oats and pumpkin is a super food, so you can pretend that you’re eating healthy. This is the last time I’ll say it for the rest of the year, I promise – give pumpkin a chance! Edwin and I would love to know what kinds of Christmas cookies you baked this year, and which ones were well received. Please share your favorites with us! Preheat oven to 350 F. Combine flour, cinnamon, baking soda, baking powder, salt and nutmeg. Set aside. 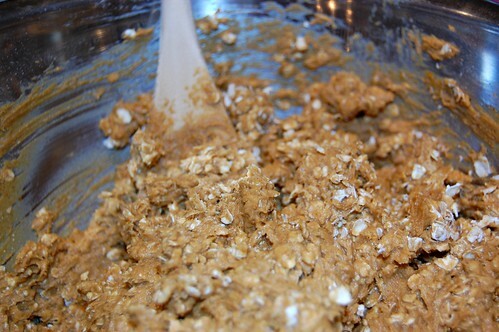 In a large bowl with a mixer beat butter until softened. Beat in brown sugar until fluffy. Beat in eggs, then pumpkin. Add flour mixture and beat until combined. 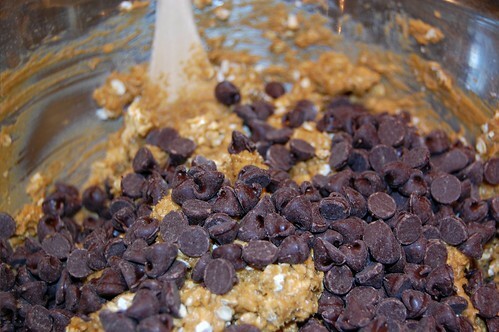 Stir in oats and chocolate chips (use a thick, sturdy spoon. I’ve broken flimsy wooden spoons while stirring in all the oats before!). Use a teaspoon measure to scoop onto parchment-lined cookie sheets, spacing about 1 inch apart. Bake for 12 minutes. Cool for 1-2 minutes, then move to a wire rack. Cookies will cool quickly. Makes about 120. It was good stuff! Thanks again, Meghan 🙂 Have a happy new year! I tried the cauliflower mash potatoes today. Who knew cauliflower could taste so good.